KELOWNA, BRITISH COLUMBIA--(Marketwire - Oct. 29, 2012) - BigSteelBox, Canada's fastest growing moving and storage company using steel shipping containers is launching BigSteelBox Structures, a new service offering modified containers made of steel into living quarters, offices, labs and offices for construction and industrial sites in remote areas across the country. The company, which has 18 stores across Canada, has built its success around changing the way people looked at moving and storage with its BigSteelBox shipping containers and the idea that BigSteelBox is a better way to store and move stuff. With the launch of the Structures division, BigSteelBox is now aiming to change the way people look at shipping containers. 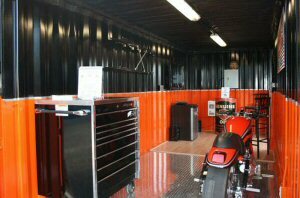 BigSteelBoxes are 6' to 53' containers made of eight-gauge, ISO certified, ship worthy steel. While BigSteelBox has modified containers for years, the new Structures division will be focused on larger scale projects and creating a product line for the more common mods including offices, guard shacks and mobile labs. BigSteelBox Structures had its debut at this year's Global Petroleum Show in Calgary where it exhibited luxury living quarters for work camps built from shipping containers. The company recently merged with Mission Group, a developer whose condo building expertise has been utilized to create a display of living quarters out of a big steel box. The living quarters is one 40' BigSteelBox modified into two separate spaces, each with a private bathroom, built-in cabinets and wardrobe, wall-mounted media hub, 32" inch swivel TV and extra long single bed. The result is a finish that rivals a high-end condo. To see more visit the photo gallery. Jason Siebenga, president of BigSteelBox says, "A lot of companies operating in remote camps have trouble keeping their workers. Good accommodations make a difference and these luxury boxes beat a trailer and bunk beds any day." Virtual indestructible, portable, and much cheaper to move than traditional portable housing, modified containers as living quarters are ideal for oil and mining camps in remote areas. They come with their own bathroom, wood cabinets, massive mirrors and electronic sound system. The popularity of shipping container housing has been steadily increasing in Europe as a modern, affordable and urban living option, but BigSteelBox is currently focused on portable living spaces for work camps in remote areas. Demonstrating it can do any requested modification it recently made a custom Harley Davidson BigSteelBox, complete with parking spot for the ride, a full tool box, beer keg and a big screen TV. See photos here. "It's a big steel box - strong and tough and virtually indestructible," says Siebenga. More information can be found at www.bigsteelbox.com/Structures.